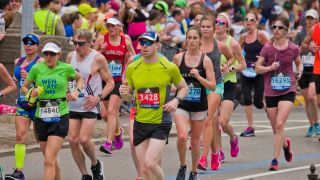 The 2019 Boston Marathon is set to see a mighty hoard of 30,000 runners take to the city's streets today. The oldest marathon in the world, it's still the long distance extravaganza to watch stateside in the week of Patriots' Day and this, the 123rd race, is going to be aired so you can get a Boston Marathon live stream it from anywhere in the world. 2019 Boston Marathon - when and where? The Boston Marathon will see 30,000 runners aim to cover the 26.2 miles across the city to finish on Boylston Street. This year’s Boston Marathon will be held on Monday, April 15 with the competitive races set to start from 9.30am ET / 6.30am PT, 2.30pm BST. The race itself, which is Olympic standard, starts in Hopkinton and works through eight municipalities, ending on Boylston Street. The racing standard is also high even for the amateurs. For men (aged 18-34) racing who aren't doing so far a charity, they need to have run a BAA recognised marathon in under three hours and five minutes, for women it's three hours and thirty five minutes or less. So it's serious business. As the first marathon to feature a female finisher, in 1967, this is a historically great race for the women's elite. Current champion Desiree Linden, was the first American woman to win the race in 33 years. She will return this year alongside fellow American Jordan Hasay. In 2017 at Boston, Hasay ran the fastest-ever marathon debut by an American woman. For the gents taking part in the elite race it's Americans Dathan Ritzenhein and Jared Ward who will be going for first place. Last year's winner, Yuki Kawauchi of Japan, will also be there to compete, no doubt at the front of the pack. As you can imagine the 2019 Boston Marathon will live stream for the world to enjoy and this guide will help you find the best way to watch the race from anywhere you happen to be on the planet. We'll tell you about your US and UK options below (there's good news and bad news), but you'll likely hit a bump in the road if you find yourself abroad and try to watch a Boston Marathon live stream. Broadcasters geo-block coverage. But by using a VPN and changing your IP address back to your home country, you'll discover that it's possible to clear that hurdle - assuming of course you're not breaching the service's Ts&Cs. If you’re in the US and want to watch this year’s Boston Marathon, then you’re in luck as you have several ways to watch the event. NBC Sports will air all the action on the day starting from 8.30am ET running to 1pm ET - that will be enough time to watch the elite racers finish. If you’d prefer to stream the Boston Marathon on your computer, streaming devices or on mobile, the NBC site and NBC Sports App will also be streaming the event. However, with both of these options you will need a cable subscription to watch the race as the Olympic Channel is only on cable and NBC Sports requires that you login using your cable providers’ details. If you happen to be a big athletics fan and plan on tuning into the Diamond League as well as the rest of the IAAF Championships, NBC Sports Gold also offers a Track and Field Pass for $74.99 a year. The service lets you stream all of the top marathons and other athletic events without commercial interruptions and if you happen to miss an event, you can always watch it later on-demand. For those without cable, that NBC access is tough since your credentials will be asked for. Fear not as there are services that let you watch NBC without cable. It just so happens we have a handy few of the best right here for you to pick from. DIRECTV NOW $50 per month - DIRECTV NOW gives users all the channels needed to watch the athletics and loads of other sporting events. Use DIRECTV NOW’s 7-day trial will let you test out the platform. Sling TV $40 per month - Sling TV is an inexpensive way to watch sport. Sling TV is compatible with Apple TV, Roku, Xbox One, Chromecast as well as lots of other devices and its easy to get started with a 7-day free trial. fuboTV $19.99 for the first month - fuboTV has a low introductory price though after that the price goes up to $44.99 a month and includes 70 channels. There's a 7-day trial available so you can test out its functionality for yourself. Unfortunately for athletics fans trying to watch the Boston Marathon in the UK this weekend, the race will not be shown live on television. Sorry everyone - you'll have to wait until the London Marathon on April 28 to get your long-distance running kicks. Men's Push-Rim Wheelchair: 9:02 a.m.
Women's Push-Rim Wheelchair: 9:04 a.m.
Handcycles and Duos: 9:25 a.m.